When I met Jasmine in the Florida Keys, I loved the sheer, flowing clothing she was wearing. I asked her where she got them and she said she designed and made them herself! WOW was I impressed! I am an art wear lover and I do wear other art wear but none have the quality and exquisite designs that my Jasmine Sky Designs originals have. I’ve traveled all over the world with them. When I put my dress on for the wedding, jaws dropped. My friends couldn’t believe I was wearing such a beautiful dress. I felt so beautiful in it that I know I glowed. I got so many compliments from my friends and family alike. No one had ever seen such a beautiful dress and everyone wanted to know where I bought it. They were blown away when I said I had it made especially for me by my artist friend, Jasmine Sky! 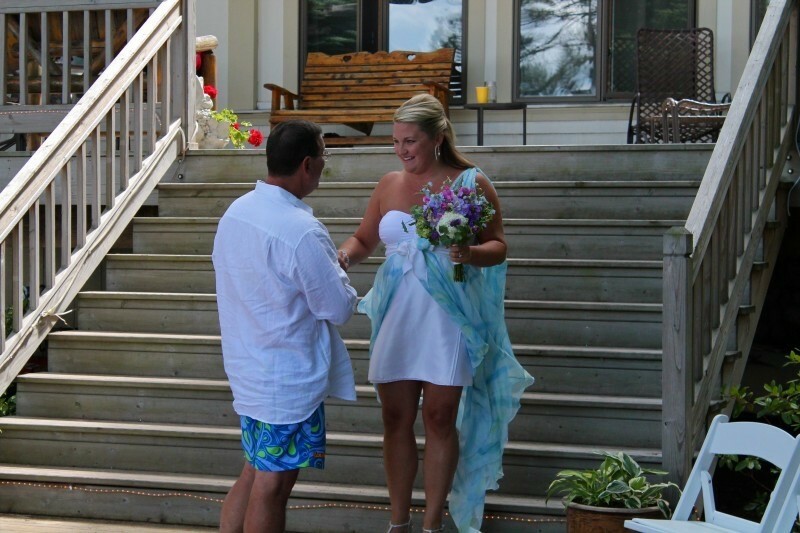 When my fiance saw me for the first time in my dress at the wedding, he just said, “Wow! !” He and everybody just stopped and looked. It was a pretty amazing moment and one I will always remember. I haven’t had the opportunity to wear my special dress since that wonderful night. A honeymoon is being planned for later on this winter and I know it will include a beach and warm water and gentle breezes, just perfect for my beautiful Jasmine Sky Original. I have been buying hand painted silks from Jasmine for 13 years. When my daughter told me her wedding would be in wine country California, I considered mother of the bride dressing options. After several months, I finally decided that I needed to have a Jasmine Sky original… even if I was going to be in a vineyard instead of on the beach. 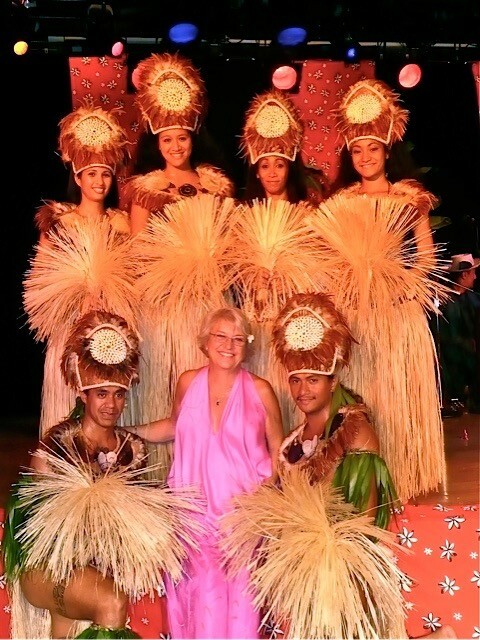 I normally had worked with Jasmine in person, but for my MOB dress I would have to work long distance. I was concerned about trying to work through the process long distance, but Jasmine has a real talent for asking questions, suggesting options and helping you visualize possibilities. She was patient and available. I lucked out when I Google searched ‘beach wedding dresses’ and came across Jasmine Sky. I had no idea that someone actually made beautiful flow-y dresses/sarongs. Jasmine’s work speaks for itself. Most importantly in this process, I loved the fact that Jasmine took her time and communicated with me via phone, text, email. She was always helpful. She worked with me and my budget to get the perfect dress for my destination wedding!!! Jasmine will not steer you wrong. Her experience with brides and what they desire is outstanding. Wearing my dress on my wedding day was perfect and the photographer loved the dress so much that we decided to take extra pictures down at the beach because he loved the way it blew in the wind. I had so many compliments on my dress. I absolutely loved it. Thanks Jasmine! I knew that a “normal” wedding dress just wouldn’t cut it for me so I started scouring the internet. When I found Jasmine’s site, I looked at every single design and fell in love with one more than the next. Not only did I decide that this was exactly the type of dress I wanted, I decided it was an excellent excuse for a girl’s trip with my mom and sister from Idaho to Jasmine’s studio in the Florida Keys. What a magical place! I made all of my decisions in one shot. Jasmine also designed the attire for my wedding party. She did all of the dresses for my girls and my mom and did a shirt for my husband. I specifically wanted all different colors and designs and knew it would all come together and be as magical as everything was in her shop. It was such an array of colors and textures… perfect for our beautiful setting. 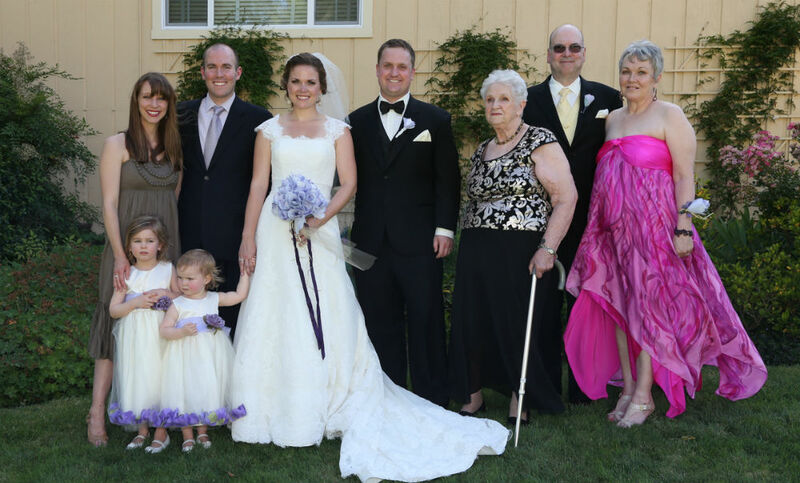 My bridal party all worked with her specifically over the phone and email and they had a wonderful experience as well. We designed the most beautiful and luscious dress I have ever worn. I absolutely LOVE it. It was better than I could have ever imagined and on my wedding day I never wanted to take it off. It is so soft and made me feel so wonderful, I couldn’t have asked for more. It had many pieces and every one is special to me. When I found Jasmine’s website I was blown away. I was having a hard time deciding how much of a bridal look I wanted. 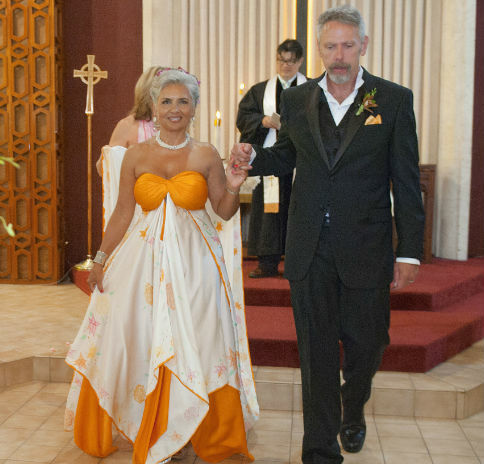 This was my second wedding and I didn’t want a traditional gown for sure. I just couldn’t picture what I wanted. Jasmine’s process was more detailed that I thought it would be. Compared to what you go through when looking for a wedding gown I would say it was about the same but far more personal. I am not overly thrilled with my body shape and the weight that I am carrying but she didn’t care. She made me feel amazing and beautiful through the entire process. She had never met me and she was my ally through the whole process. She was by my side the entire time. Communicating with me through everything. Jasmine sent me a picture of the gown on a mannequin before she sent it to me and when I opened the box I could see right away that my trust was well placed. Before I even took it out of the box I was thrilled! Every time I tried it on I just couldn’t believe how beautiful it was and how much I just loved it. It flowed in the wind exactly the way I imagined it would. I was a perfect balance of being a bride and being myself. It was a great centerpiece for the wedding party outfits as well. It brings tears to my eyes when I think about that day. Jasmine’s creation was perfect. Perfect for me, the day and the setting. 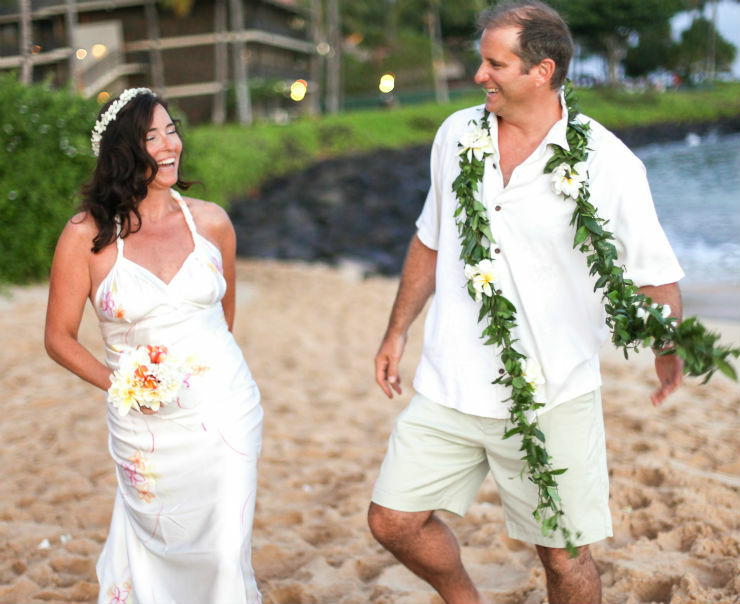 It took my husband’s breath away…I think that says it all. …I am such a stickler for detail but Jasmine had the patience of a saint with me… my wedding dress was the dream dress I had always wanted. Never have I seen any designer be able to create the magic that Jasmine is able to create with fabric and color. Her hand painted art, the vivid colors and the feminine lines – that show what needs to be shown and hides what needs to be hidden – create a perfect picture of true femininity, and sensuality. I have many silks by Jasmine and when I wear them I feel beautiful. The colors make me glow. Her designs give me a feeling of being proud to be a woman. I wish for every woman to dare to find herself and enjoy her own unique beauty in a Jasmine Sky Designs original. read more. 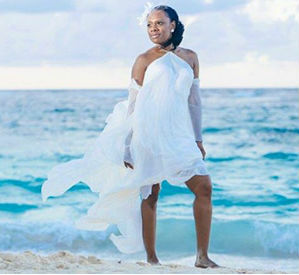 “When I returned home from a fabulous Keys vacation and surprise nuptials my friends went wild for each photo and every detail! “If your ceremony was a surprise,” they asked, “then how did you get such a fabulous dress last minute? 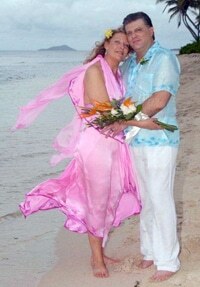 This could be a Vera Wang!” “It’s by the ‘Vera Wang’ of beach wedding dresses, Jasmine Sky.” I replied. 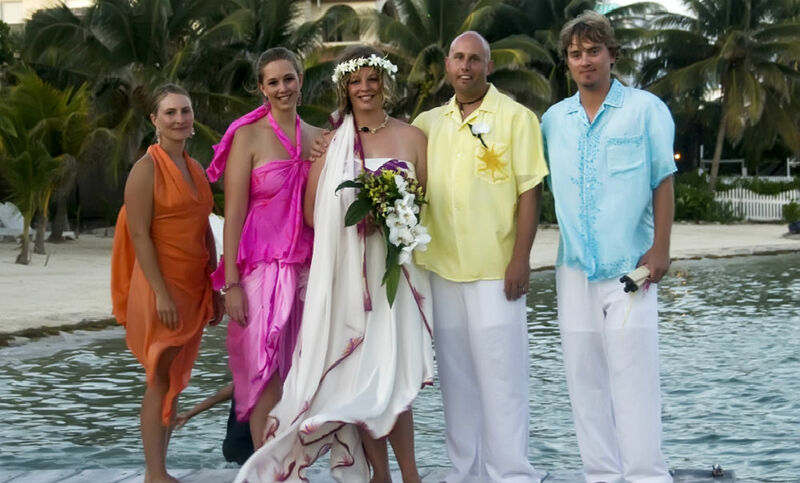 To this day my dress is still talked about as the most perfect tropical getaway, dream wedding dress there ever was. 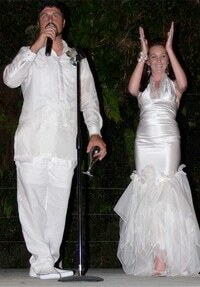 Thank you Jasmine!” April & Ralph, USA Married in Key West, Fl. “Thank you for all of your help to create the dress of my dreams! I have gotten so many compliments as I have shared the photos.” Christina & Jedde, USA Married in Key West, Fl.